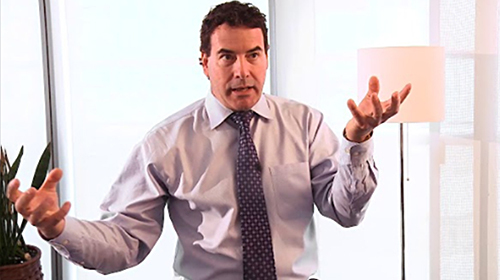 PRESUMPTION OF SAFETY In this eighth 1:20 minute video of a 21-part series, Shawn Buckley explains Section 8 of the Charter of Health Freedom, “Presumption of Safety”. This section declares that natural health products, traditional remedies and low-risk treatment options regulated by the Charter of Health Freedom are presumed, by law, to be safe. Only with evidence of harm would government interference be appropriate. In establishing a basic presumption of safety, these products and modalities are protected by default, just as they are in the United States. By presuming that low-risk health products are safe, Canadians can depend on the availability of products they rely on to improve and maintain their wellness. Without this standard, products can be swept off shelves without warning to the people who use and need them. As the author of this standalone Act, Shawn Buckley makes clear the key features of each section. He breaks down the proposed legislation into language that everyone can understand. In the next clip, Shawn will discuss the establishment of the Ministry of Wellness, a much anticipated new regulatory body separate from Health Canada. 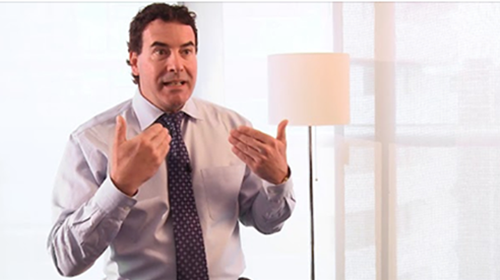 INTERPRETATION In this seventh 1:25 minute video of a 21-part series, Shawn Buckley explains Section 7 of the Charter of Health Freedom, “Interpretation”. This section answers the question, ‘what is a natural health product?’ Definitions for important terms such as natural health product, traditional medicine and treatment device are described. 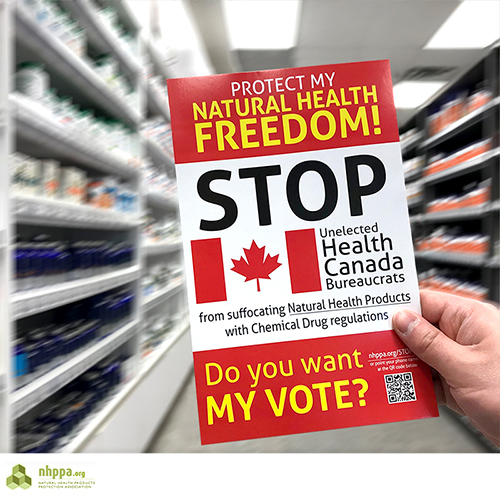 It is made clear to everyone – whether a member of the public or the highest court in Canada – that natural health products and practices are to be governed and regulated solely under the Charter of Health Freedom. Ambiguity, confusion and the lack of adequate language in our current laws lead to the over-regulation of natural health products and practices. The Charter solves this problem. As the author of this standalone Act, Shawn Buckley makes clear the key features of each section. He breaks down the proposed legislation into language that everyone can understand. Up next is, “Presumption of Safety” that speaks to an approach critical to the Charter’s application. The End of Natural Health Products? Good question. 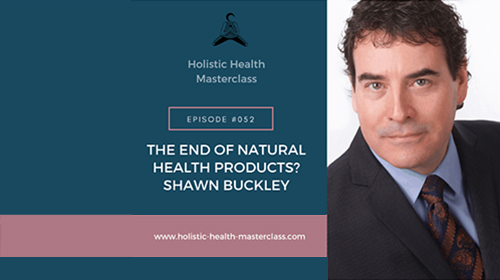 Functional Medicine Practitioner and Clinical Nutritionist, Brett Hawes interviews Shawn Buckley. 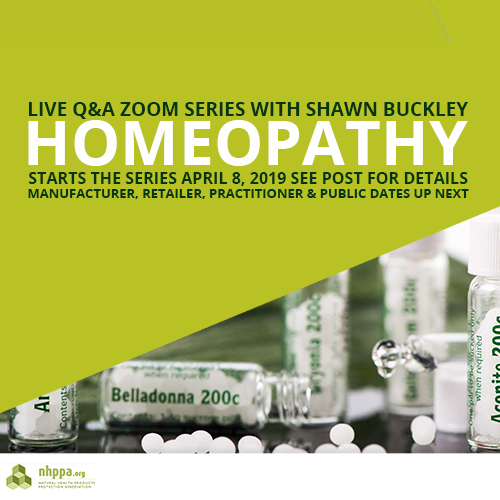 The episode (76 minute listen) released on March 20, 2019 is part of Brett’s popular Holistic Health Masterclass podcast. 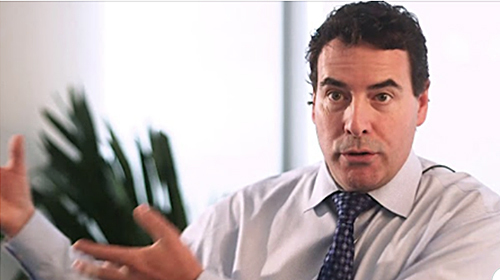 Brett is a long time advocate and activist for the national natural health community. 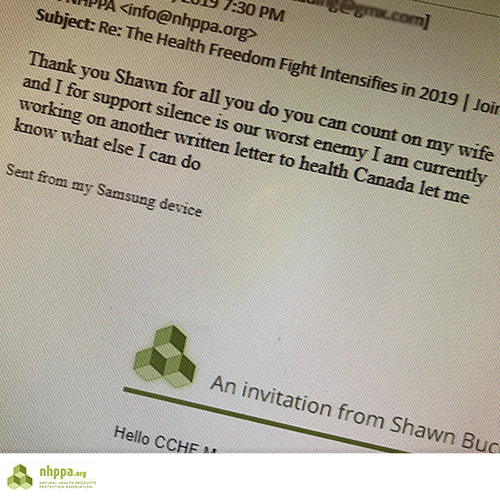 Together with NHPPA’s Julia Rickert, and two Toronto area nutritionists, he held the country’s largest rally opposing Health Canada’s actions after reading Shawn Buckley’s Discussion Paper on Bill C-51. Should every NHPPA writing incite that much drama! This podcast examines the impacts of Health Canada’s plan to group natural health products under a single set of regulations with non-prescription chemical drugs. Brett expresses his concern through the lens of a nutritionist, articulating clearly that Health Canada’s Self-Care Framework would end in severe restrictions for nutritionists and other natural modalities in Canada. With limited access to natural health products including lower potency products with poor efficacy, stifled label claims, the inability to share information outside of label claims with clients, and monumental fines – Brett questions how he will continue practicing. If you’re a natural health practitioner, you should be asking the same questions. Listen now. Get informed. Take action. Every. one. 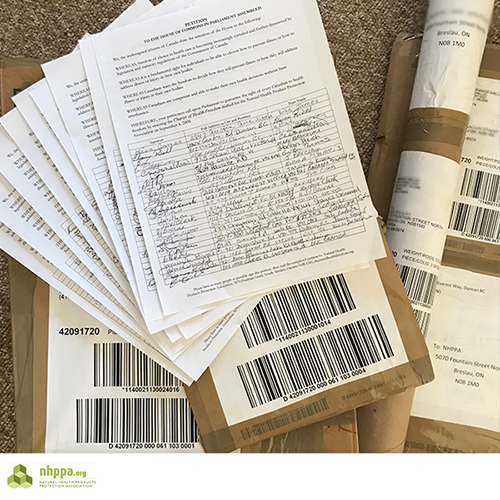 of these 189 signatures was hard won. The NHPPA booth materials shipment from the Victoria Women’s Show volunteers arrived last week. It was a first for the Charter of Health Freedom petition to occupy space at a “secular ” event where natural health wasn’t the platform. Eileen Nielsen and Jennifer Shelley. You are a rare pair. 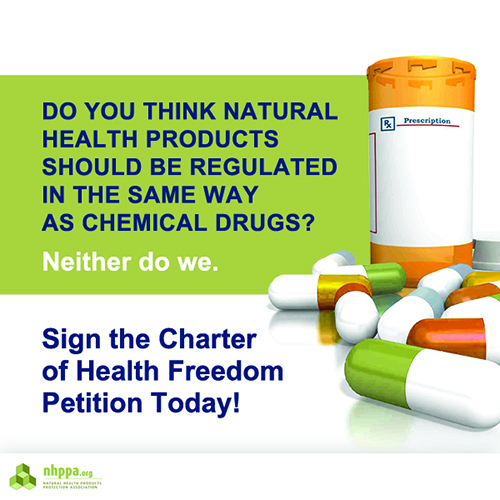 The latest Charter of Health Freedom petition update will be posted a week from today. NHPPA would love to see some French and Chinese petitions come in. p.s. Superior shipping skills, Jennifer! We’re in a Charter state of mind! 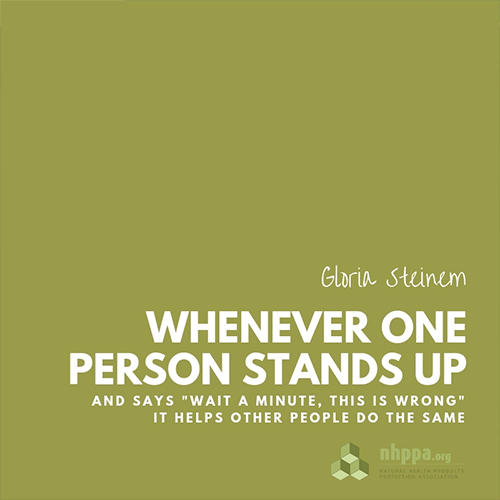 NHPPA’s newest poster provides emphasis to sign the petition. It’s for natural health practitioners, retailers and public to attract engagement of those in their influence. Patients/clients, customers and communities need to know what we are facing. Many are still unaware and likely want to know. Health Canada’s proposed Self-Care Framework aims to group natural health products under the same set of regulations as non-prescription chemical drugs, even though they are vastly different products. We are on the trajectory of losing even more access to products, practitioners and what we can say, and even can know, about them. These reckless government decisions will not stop. Send Health Canada the message that this is unacceptable. Canadians across the country need to make this a grassroots action, now. CONSTRUCTION OF LAW In this fifth 1:39 minute video of a 21-part series, Shawn Buckley explains Section 5 of the Charter of Health Freedom, “Construction of Law.” This section places the rights outlined in the Charter above all other laws, requiring that any policy in Canadian legislation must first adhere to the standards set in the Charter of Health Freedom. Similar to the Canadian Bill of Rights, the Charter is a foundational document. It ensures Canadians’ right to choose is placed at the base of all law. The statements in this section prevent further legislation from negating the Charter’s principles. It prioritizes Canadians and their right to decide what goes in their bodies. As the author of this standalone Act, Shawn Buckley makes clear the key features of each section. He breaks down the proposed legislation into language that everyone can understand. Stay tuned for the sixth clip, Regulating Natural Health. Three things. 1. We never tire of receiving emails of encouragement or sharing of independent engagement. 2. Knowing that Dave is writing *another* letter to bureaucrats gives us hope that there are others offering consistent pressure. 3. He has been a long time advocate and activist. Different definitions of amplifying the work to make a wrong, a right. Dave writes/speaks on behalf of all of us and also takes intentional action to bring about change. Who is ready to do some letter writing with Dave and the NHPPA? We are about to launch a national campaign so consider your personal message. You will be asked to add a few lines that are meaningful about your personal story, in a letter drafted by Shawn Buckley and the NHPPA team, directed to your Member of Parliament. Get ready!